What game is it? Is it just a fake game made up for the movie? According to Destructoid, it is not a real game. However, there is a Flash game linked in that article that resembles the game from Big. 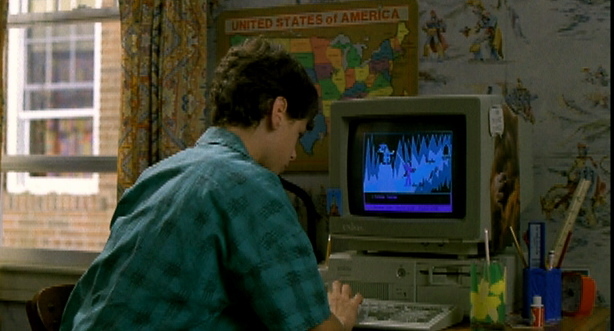 Twenty years later, BoMToons has sought to remedy this situation by creating a little Flash game which very closely resembles the one seen in the film. There isn't a whole lot to it, as there was very little to work with from the source material (which consists of one room in a cave and one text command entered). The game, called The Cavern of the Evil Wizard, takes place entirely in that one room and is solved in exactly the same manner as in the film, but there are a few other commands in the text parser that you can play around with. No the game is not made up it is called Cavern of the Evil Wizard. What's the arcade game Kate and Dade play in the movie Hackers? Identifying Android game seen in Fast & Furious 7 movie? What is this Korean fox girl video game from an advertisement?